CrossFit seems to be everywhere. 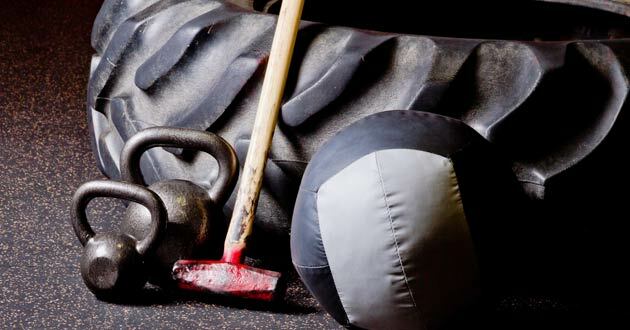 Gyms are getting rid of weight machines and stocking up on the kettle bells, weight sleds, tires, and other heavy equipment that goes with CrossFit, a high intensity, circuit workout. There are now programs all around the country, and there are many CrossFit classes for kids, some for children as young as 4 years old. Say what? Yes, it's true, and growth in such programs have gotten flack for obvious reasons. Some critics think kids should just run and play games, without thinking about exercise. Others argue from a safety standpoint as they associate CrossFit with heavy weightlifting and worry that improper techniques could damage a child’s growing body. Here’s what I think: CrossFit is a workout format that incorporates children's natural playfulness and energy. It lends itself to quick workouts that are full of variety that keeps kids intrigued and moving. No, I’m not suggesting loading your kid up with a kettlebell for 30 reps of deadlifts. But what’s wrong with some crab walks followed by a little jump roping? As a mom I am constantly thinking about how I can keep my son healthy and happy. Since he's a baby, I tend to focus primarily on his nutrition and mental well being. But as he grows into a toddler and a child, I foresee a hectic schedule filled with activities. There will be trips to the playground, T-ball practice, soccer camps, whatever! I want him to have access to any and every program that will foster the value of exercise throughout the rest of his life. In this day and age, kids don't have to be limited to the basic afterschool activities of past generation: basketball, football, track. Your kids can go to skateboard clinics, yoga seminars… I even saw an ad for a trapeze camp. The sky is truly the limit, so when I stumbled across an article touting CrossFit for kids, I thought "Is 8 months too young to sign up my son??" Just kidding! In truth, however, CrossFit can have the same benefits for children as it does for adults. It makes you stronger and improves your cardiovascular health. The classes are also a great way to make new friends with a common interest. Most importantly, CrossFit for kids encourages a lifetime of exercise, and a disciplined attitude towards health. In a world filled with video games and iPads, I’d say this is huge. Try this quick CrossFit workout with your child next time you’re out in the backyard. See what you think, and more importantly, what they think! Remember to play up the fun factor while doing this workout! It lends itself well to fun and games! Ready for your own mom workout now? Check out How to Cram a 45 Minute Workout Into 4 Minutes and 5 Exercise Moves for Busy Women!